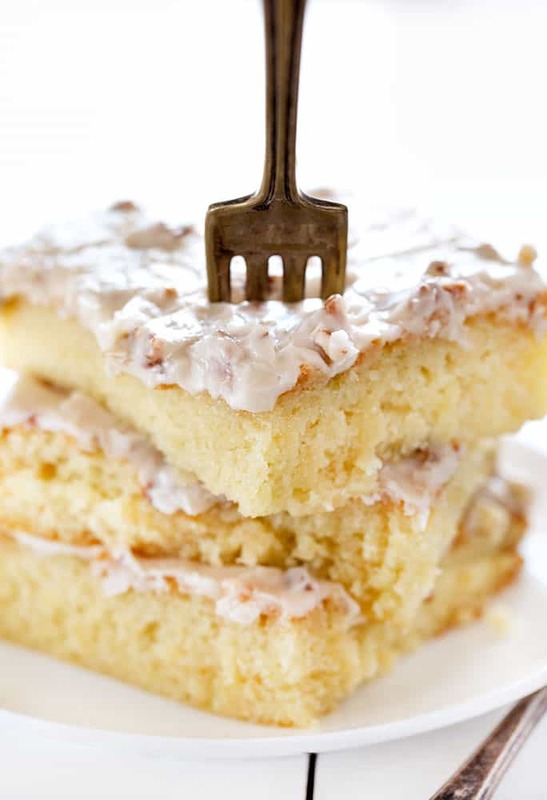 If you love almond flavoring, this is the cake for you! The cake is perfectly moist with the softest texture and then paired with an almond vanilla pecan frosting. SO GOOD! In a large saucepan, bring 1 cup butter and water to a boil. Once butter is melted and there is a low rolling boil, remove from heat. IN THIS ORDER: Stir in flour, sugar, sour cream, 1 teaspoon almond extract, salt, baking soda, and eggs. Whisk after each addition until smooth. Pour batter into a prepared 10x15-inch baking pan. Combine 1/2 cup butter and milk in a saucepan; bring to a low rolling boil, then remove from heat. Add in sugar 1 cup at a time making sure to whisk after each addition. Add in 1/2 teaspoon almond extract. Whisk well. It will be similar to a gravy consistency. Stir in pecans. Spread frosting over warm cake.